Shipping is free via USPS. 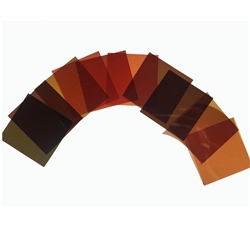 You will receive a package of 10 different shades of 2"x2" gel filters used to take cell phone pictures of aquarium life under heavy blue light, including LEDs. These filters help filter out the excessive blue light to get a clear, color corrected image. Hold filter over camera lens with your fingers to take pictures. For close-ups use a clip on macro lens. You have to be really close to focus with a macro lens, so move the coral close to the glass/acrylic and put your cell phone up against the glass.